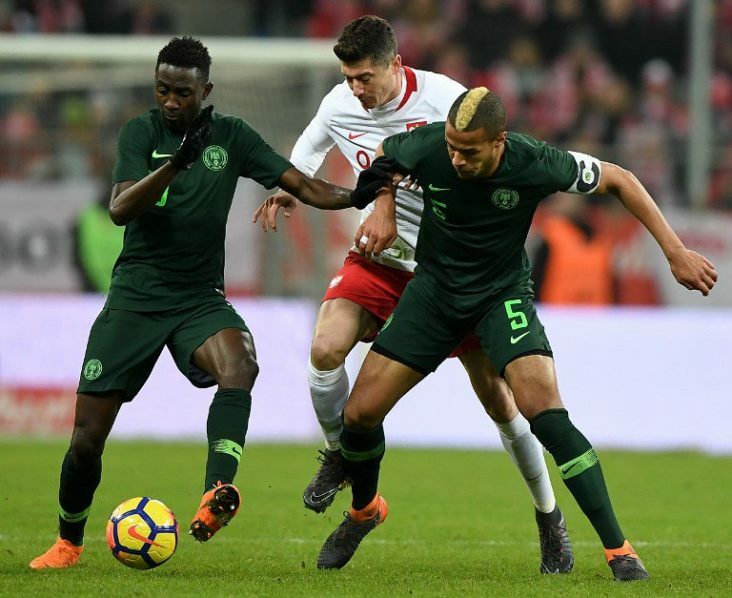 Poland Vs Nigeria Player Rating: How Did The Super Eagles Players Perform? The Bialo-Czerwoni (White and Reds) of Poland locked horns with the Super Eagles of Nigeria in an international friendly match on Friday night. A Victor Moses penalty in the 61st made all the difference for Nigeria Super Eagles, helping them to claim a 1-0 victory over the host at the Municipal Stadium, Wroclaw. The Chelsea man won and then coolly converted a 61st-minute spot kick to extend the Super Eagles’ impressive form under German coach Gernot Rohr, but how well did each Super Eagles player perform? Allnigeriafootball.com provides an answer to the question by rating the performance of each Super Eagles player in Friday’s night 1-0 international friendly victory against Poland in Wroclaw. The 19-year-old Deportivo La Coruna youngster, appeared indecisive with his positioning and decision-making in the early minutes of the game. He made a mess of a simple cross which nearly gave on loan West Brom player Krychowiak the opportunity to score the opening goal but for Leon Balogun’s timely goal line clearance. Uzoho however later redeemed himself with two big saves against Polish Captain Robert Lewandowski, as the game progressed he became more confident and commanding in the goal post of the Super Eagles of Nigeria. The right-back was not his usual self, he was shaky in defence and was caught off guard a number of times, he committed some fouls in dangerous positions and certainly this was not one of his best games in the green and white colours of the Super eagles of Nigeria. He was injured in the 78th minute and was replaced by Tyronne Ebuehi. Ekong was magnificent in defence, he marshalled the backline very, made several timely tackles and clearance. He neutralised the threat of Polish danger man Robert Lewandowski. He had a Captain’s game and looks possibly motivated by the Captain’s armband. Leon was just average in this game, he failed to track down the runs of Robert Lewandowski who struck the woodwork in the opening minutes of the match. He was not as tidy in defence like we normally see him in the colours of the Super Eagles of Nigeria. It is important to note that he made a goal line clearance that would have given Poland the lead in the first half and he was replaced by Kenneth Omeruo in the 74th minute. The Amkar Perm of Russia left-back defended decently when he was called to duty, he however did not contribute much going forward and failed to give Alex Iwobi the support and width he needed to increase our attacking threat down the flanks. This is just his first start, so there is room for improvement in subsequent matches. Ndidi was energetic as always, full of running and never afraid to make a tackle. Although he provided cover for the defence, his passes and ball distribution was below average. He played his heart out and was determined to justify his inclusion in the starting line up, going forward he showed some flashes of brilliance. However sometimes he appeared overzealous by making some crunchy tackles, he had a decent game and certainly deserves another opportunity to show what he can do. He was replaced by Ogenyi Onazi in the 65th minute. He was handed the number 10 role in the absence of Captain John Obi Mikel, On the night he lacked the vision, creativity and composure of Mikel, he failed to link the attack and had a very poor game. He was replaced by John Ogu in the 82nd minute. He started the game like a house on fire, putting the opponent’s defence under pressure with some fancy foot works and darting runs into the polish 18 yard box but just like his displays this season in the colours of Arsenal, his final balls or deliveries into the opponent’s vital areas leaves much to be desired. Although he is just 21 and a huge talent but that aspect of his game must improve for club and country. He was replaced by Ahmed Musa in the 59th minute. He started the game slowly and was quite in the first half, he however burst into life in the second half, making some dribbling runs into the polish vital areas and one of those mazzy runs resulted into a penalty in the 61st minute, which he calmly converted with the goal keeper rooted to the spot. He was starved of the ball most times and was left isolated in the attack due to poor service from Kelechi Iheanacho. He failed to provide the kind of attacking threat that wold have put the Polish defence under serious pressure. He was substituted in the 89th minute by Moses Simon. He came in for Alex Iweobi in the 59th minute and made his trade mark runs but it yielded little result to change the course of the game. Onazi replaced Joel Obi in the 65th minute of the game, he provided more steel and cover for the defence and helped maintain the score line and kept the polish attack at bay. He came on for Leon Balogun in the 74th minute, he was shaky and looked error prone in defence. He has to do better, if he is to make the final squad to Russia 2018 world Cup in June. He replaced Shehu Abdullahi at right back in the 78th minute, he put in a decent shift for the few minutes that he was on the pitch, he helped preserve the slender lead and neutralised any threat from the Polish attack. I think Tyronne Ebuehi will give Shehu Abdullahi a good run for the starting berth at right back at the World Cup in June. He replaced Kelechi Iheanacho in the 82nd minute, he added some freshness to the Super Eagles midfield and helped preserve the lead for the remainder of the match. Moses Simon: Rating – ? Simon replaced Odion Ighalo in the 89th minute and barely had time to make any impact on the pitch, hence he is not rated for the match.